Phenomenal results are achievable with the ideal combination of clinical skill, materials, and dental lab. In this case, a clinician shows a gorgeous smile transformation with veneers. 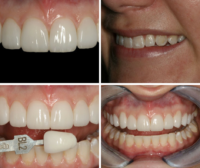 This patient presented with an ideal case selection for no prep Empress Aesthetic veneers. Her goal was to even out her smile color and give her teeth a more uniform appearance without removing any of her existing tooth structure. As an ideal candidate, the clinician invited her to be one of two demonstration patients in an Over the Shoulder program hosted by Gold Dust Dental Lab. The clinician treatment planned teeth #4-13 and chose not to place a margin or finish line. Gold Dust fabricated the no prep Empress Aesthetic veneers in an 020 bleach shade. The addition of length created a canvas to provide awesome translucency and incisal effects that really brought life into the teeth. This wouldn’t have been achieved through other “prep-less veneer” technology. The results really speak for themselves! This case was bonded into place in about two hours and transformed the patient’s smile. What success stories do you have of veneer cases? We’d love to hear from you in the comments!